Jack Christensen, 8, has a snack at his home in Waunakee, Wis., after school on Oct. 5, 2016. 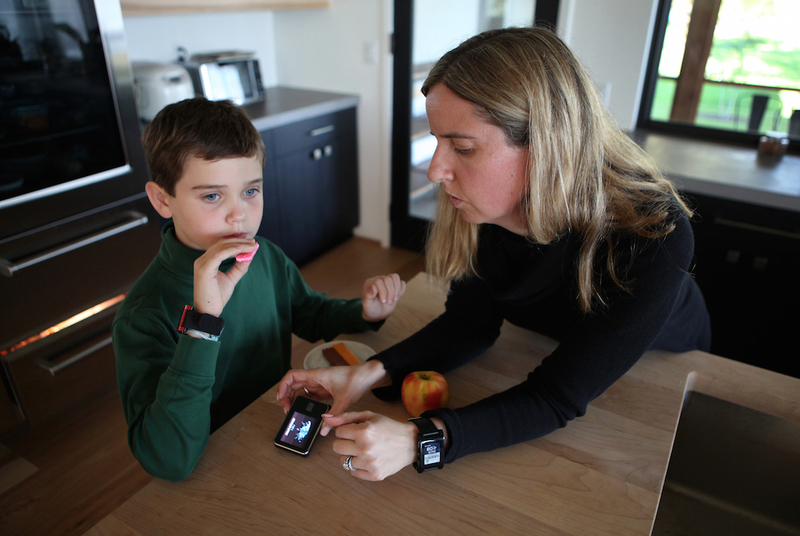 His mother, Jess Franz-Christensen, logs his carbohydrate intake on a monitoring device. Jack has Type 1 diabetes and his parents wear watches to monitor his blood sugar level 24 hours a day to ensure his numbers are not too high or low. Rapidly rising insulin costs have prompted Franz-Christensen to become a parent activist pushing for lower drug prices. WAUNAKEE, Wis. — Jess Franz-Christensen did not realize the seriousness of her son’s Type 1 diabetes diagnosis until staff in the doctor’s office offered to call an ambulance to take him to the hospital. Her next shock: The cost of Jack’s medicines. The drugs, administered through an insulin pump, cost $1,200 a month. “We’re really fortunate. We’re able to pay for stuff,” said Franz-Christensen, whose husband, Scott, is a physicist, while she stays home to care for Jack, 8, and their daughter, Kendall, 11. Prices for insulin products have nearly doubled in recent years, including Lantus SoloSTAR — one of the drugs that Medicaid and Medicare spent the most on in 2015. Its price increased by 81.5 percent between 2011 and 2014, according to data analyzed by the Wisconsin Center for Investigative Journalism. The data were provided by California-based First Databank, a supplier of U.S. commercial drug pricing information. Overall, the price of insulin nearly tripled between 2002 and 2013, prompting calls this month for a federal investigation by former Democratic presidential candidate Sen. Bernie Sanders from Vermont. “They (drug companies) are making billions and billions of dollars on people who literally can’t afford it,” said Franz-Christensen, who has joined #MyLifeIsNotForProfit, a national grassroots parent movement. Recent nationwide news coverage has focused on the rising cost of EpiPens, which counteract potentially fatal allergic reactions to peanuts, bee stings and other triggers. But the $600 cost for a two-pack of that medicine is just one example of lifesaving drugs with skyrocketing prices. The costs of seven widely prescribed antibiotics, cancer drugs, arthritis medications and other prescriptions have escalated between 29 percent and 5,241 percent in recent years, according to a joint investigation by the Wisconsin Center for Investigative Journalism, Wisconsin Health News and Wisconsin Public Radio. The investigation examined the impacts of and reasons behind the overall rise in prescription costs, including drug price increases since 2011, using proprietary First Databank data. Synthroid, which is used to treat hypothyroidism, is the most commonly prescribed medication in the United States and has been on the market for more than 60 years. In just the past six years, it has nearly doubled in price, according to the Center’s analysis. The generic version of Synthroid, levothyroxine, has gone from 14 cents to 46 cents per pill, an increase of 231 percent between 2011 and 2016, the analysis shows. A single two-week dose for Humira, a medication that treats conditions including rheumatoid arthritis, plaque psoriasis and Crohn’s disease, has increased 129 percent since 2011, to $2,000. Price increases have made Humira and other anti-inflammatory drugs among the most costly in the country, according to insurers. The price increases, which continue to mount, place economic and emotional pressure on patients and their families, squeeze the budgets of health care providers and raise costs for taxpayers in Wisconsin and nationwide, the joint investigation found. Some pharmaceutical companies have taken action to extend the patent protections on their products, blocking cheaper generic versions from being developed. As some companies stop making certain low-cost drugs, other companies gain monopolies over the market. Companies are introducing more high-cost “specialty” drugs such as Humira that treat lifelong conditions. As the nation’s population ages, the demand for prescription drugs increases; more than half of Americans now use them. One practice is known as “product hopping,” in which a company makes changes to a drug to extend its patent protections, keeping others from entering the market with cheaper alternatives. There also have been fewer brand name drugs coming off patent and being replaced by lower-cost generics, said Larry Levitt, senior vice president for special initiatives at the California-based Kaiser Family Foundation. According to a report from health care information company QuintilesIMS, in 2014, spending on medications increased at the highest rate since 2001. The increases were driven by “innovative” new medicines, a lower number of brand name drugs losing patent protection and price increases. In addition, as competitors drop out of the market, the remaining companies are “raising prices significantly and earning substantial profits,” Levitt said. For instance, he noted that an EpiPen competitor temporarily ceased production after a complete recall of its product. Levitt also pointed to the pharmaceutical company Valeant, which raised the price of two cardiac care drugs by 525 percent and 212 percent shortly after acquiring them. Outgoing Valeant CEO Michael Pearson acknowledged to a U.S. Senate committee in April that his company had been “too aggressive” in raising prices. The price jumps have caught the attention of Congress, which held hearings after Turing Pharmaceuticals increased the price of a drug that treats toxoplasmosis — an illness that can cause brain damage, blindness, miscarriage or birth defects — by 5,000 percent shortly after acquiring it. 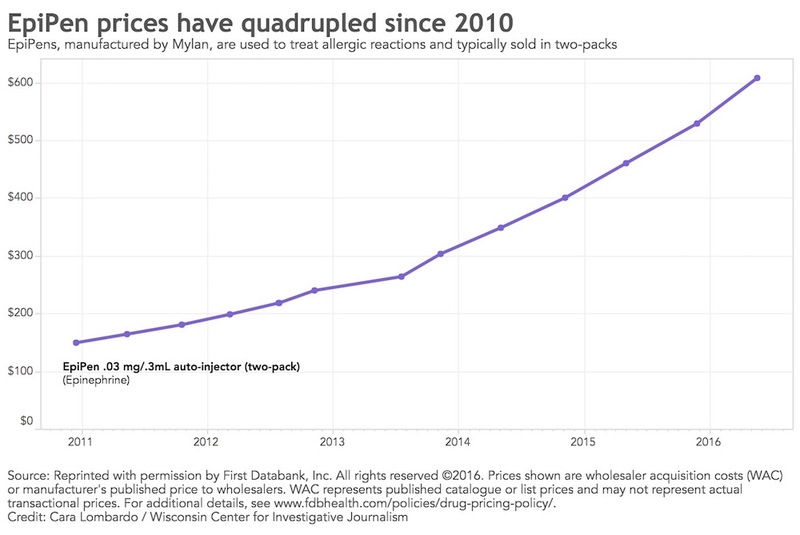 The increase in the price of EpiPens has also drawn congressional scrutiny. Between 2010 and 2016, the price has more than quadrupled, according to data from First Databank. Some lawmakers on the state and federal level are calling for new regulations to rein in drug prices. A dozen states have enacted laws requiring greater transparency in drug pricing and other measures, but no state has enacted price controls. California voters rejected a proposal earlier this month to implement their own price control system, which would require state agencies to pay the same rates negotiated by the U.S. Department of Veterans Affairs. The two sides poured more than $100 million into the effort, most of it from pharmaceutical companies opposed to the measure. Ohio residents are set to vote on a similar measure in 2017. Holly Campbell, spokeswoman for the Pharmaceutical Research and Manufacturers of America, attributed the increase in EpiPen prices to a U.S. Food and Drug Administration backlog in approving new generics and a “lack of competition” in the market. For those without insurance or who cannot afford their share, the rising cost of medications has left them facing hard choices. Kathryn Drexler, a registered nurse and certified diabetic educator at the free Living Healthy Community Clinic in Oshkosh, said some of her patients ration their insulin. So many are asking the clinic for medication help “that it’s draining our budget,” she said. Free clinics provide care and drugs to the roughly 323,000 people, or 5.7 percent of state residents who lack insurance, as well as some people who are underinsured. And while drug companies offer free prescriptions to certain low-income people with no insurance, generic medications, which comprise eight out of every 10 prescriptions, do not qualify. Most people who are living in the country without legal permission do not qualify for subsidized health care, such as Obamacare or BadgerCare, or for patient drug assistance programs. University of Wisconsin pediatric endocrinologist Dr. Ellen Connor said the price increases have thrown some of her patients into despair. For the insured, drug price hikes have contributed to higher health insurance costs, said Dr. Tim Bartholow, chief medical officer for the not-for-profit insurer WEA Trust in Madison. “Increases in the cost of health care have risen more quickly than wages, leaving the patient to pay more in the form of deductibles and co-pays,” said Bartholow, adding that too often, the construction of “redundant facilities” and the introduction of new medical devices have also boosted health care costs. Prescription drugs are a growing portion of health care spending nationwide, accounting for 16.7 percent or $457 billion of total U.S. health care spending in 2015 — about double the percentage from the 1990s, according to a report released in March. The U.S. Department of Health and Human Services report found the number of prescriptions is rising, but most of the spending growth is due to higher prices and a shift toward more expensive medications. Shih, of Pew, added that part of the increase in overall spending has to do with an aging population, which is leading to more prescription drug use. And part has to do with more expensive drugs coming on the market to treat lifelong health conditions such as arthritis. That trend is expected to continue. The report projected 7.3 percent spending growth annually through 2018, outpacing the growth in prices of other health care services. The state’s Medicaid program — which receives both federal and state funding — spent $329.4 million in the fiscal year between July 2011 and June 2012 on prescription drugs, according to the Legislative Fiscal Bureau. By July 1 of this year, annual spending had grown to $427.7 million — a 30 percent increase. The amount can vary year to year because of rebates the program receives from drug manufacturers. Elizabeth Goodsitt, Wisconsin Department of Health Services spokeswoman, said Medicaid must pay for drugs manufactured by companies that sign rebate agreements with the federal government, even if those medicines go up sharply in price. She said the program has taken numerous steps to address growing costs, such as requiring patients to get prior approval before receiving more expensive medications. Meanwhile, a September poll from the Kaiser Family Foundation found that 55 percent of Americans nationwide reported taking prescription drugs. About 26 percent of them — or 14 percent of the U.S. population — found it somewhat or very difficult to pay the cost of their prescription medication. He cited doxycycline, used to treat infections. First Databank figures show the price skyrocketed by 12,024 percent from 2011 to early 2013 because of drug shortages. The price has dropped, but the antibiotic is still 5,240 percent higher than in 2011 — or more than 50 times more expensive. Hoffmann said such price hikes can lead patients to skip their medications. Patients who cannot afford drugs for rheumatoid arthritis will become symptomatic again, leading to joint pain. That, in turn, could cause them to lose their jobs because they are unable to work, he said. Such free clinics are also pushing the federal government to join the 340B Drug Pricing Program, which requires drug manufacturers to provide outpatient medications at a discounted price to certain health care facilities, said Katherine Gaulke, executive director of the Wisconsin Association of Free and Charitable Clinics. Currently children’s hospitals, tribal facilities and AIDS clinics can qualify. “For us, at the free clinics, it’s really the rising cost of generics that makes it more difficult to provide the care for our patients,” she said. J.P. Wieske, deputy insurance commissioner, said in May that the agency does not have the authority to control drug prices and had no way of “compelling” information on why drug prices have increased. Kolste is also looking at other legislation, including a proposal that would allow first responders and emergency medical technicians to administer epinephrine from a glass vial or by syringe, similar to an Illinois law that takes effect next year. An Illinois fire protection district that spends $2,400 on EpiPens could pay $50 when the law goes into effect. Meanwhile, Baldwin has introduced legislation at the federal level with Sen. John McCain, R-Ariz., and Rep. Jan Schakowsky, D-Ill., requiring pharmaceutical companies to submit a report to the federal government a month before increasing a product’s price by 10 percent or more. “We should work together on pragmatic solutions to engage and empower patients and families with the information they need, ” she wrote in an email. A Center for Public Integrity/Associated Press investigation published in September documented the political strength of the pharmaceutical industry. It found that drug companies and their advocates spent more than $880 million on lobbying and political contributions over the past decade, contributed to 7,100 candidates for state-level offices and employed 1,350 lobbyists each year covering all 50 state capitals. But observers say the conversation around drug pricing has changed. A Kaiser poll released in late October shows 74 percent of Americans said ensuring that high-cost drugs for chronic conditions such as HIV, hepatitis and cancer are affordable should be a top health priority for Congress and the next president. Franz-Christensen hopes Congress will fix the problem. Cara Lombardo and Andrew Hahn of the Wisconsin Center for Investigative Journalism contributed to this report. Sean Kirkby reports for Wisconsin Health News, an independent, nonpartisan, online news organization serving Wisconsin health care professionals and decision makers. Dee J. Hall is managing editor of the Wisconsin Center for Investigative Journalism. Bridgit Bowden is a reporter for Wisconsin Public Radio. The nonprofit Center (www.WisconsinWatch.org) collaborates with WPR, Wisconsin Public Television, other news media and the University of Wisconsin-Madison journalism school. All works created, published, posted or disseminated by the Center do not necessarily reflect the views or opinions of UW-Madison or any of its affiliates.